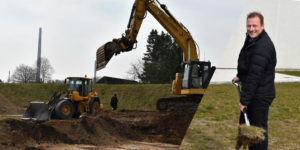 On April 1, we broke ground to Meneta Group’s latest addition: Meneta Composite Materials ApS, when Ole Jensen Bang, Managing Director, turned the first shovel of soil. At Meneta Composite Materials, we handle rubber composite materials for the sealing, acoustic and vibration markets. We apply rubber from 300 µ down to 50 µ, and from 2020, when the new building will be finalized, we will supply rubber down to 10 µ thanks to investments in new processes that will make us globally competitive. Completion of the new buildings is expected for 2020, adding 2,400 m2 production facility and 300 m2 of offices to Meneta Group’s HQ in Denmark.